Why Rain Won't Ruin Your Wedding Photos! This is a favorite photo of mine which shows that even if it rains on your wedding day, you'll have wonderful photos if you hire me. I think some of my favorite wedding photos I've taken have been in the rain! This bride was actually excited to have photographs of her and her husband in their wedding attire out in this field during a rainstorm. She came prepared with the black umbrella and matching black rain boots. I photographically made the raindrops more visible with my style of lighting. 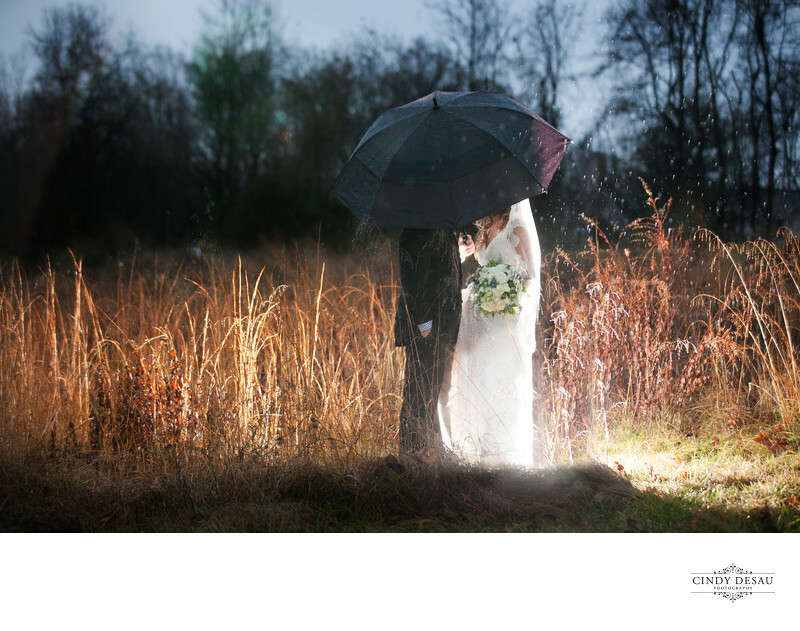 With this technique I put a light behind them, and this backlights the subjects, making the rain all the more visible. I also like how in this photograph the viewer is drawn to the bride and her white gown since my flash is behind her, accenting that area of the photograph. In the vast majority of my wedding photography we can see the couple's faces, but this is about a really cool private moment shared together under an umbrella. It’s the moment that matters.